A version of the homily of Bishop Peter A Comensoli at his installation Mass as Bishop of Broken Bay Diocese, Waitara Cathedral, Friday 12 December 2014. This is not a literal transcript. At times it is sketchy because the audio visuals in the overflow seating in the Light of Christ Centre conked out at regular intervals. One early December day back in 1531, near Mexico City, a man called Juan Diego met a most beautiful young woman at a place called Guadalupe. 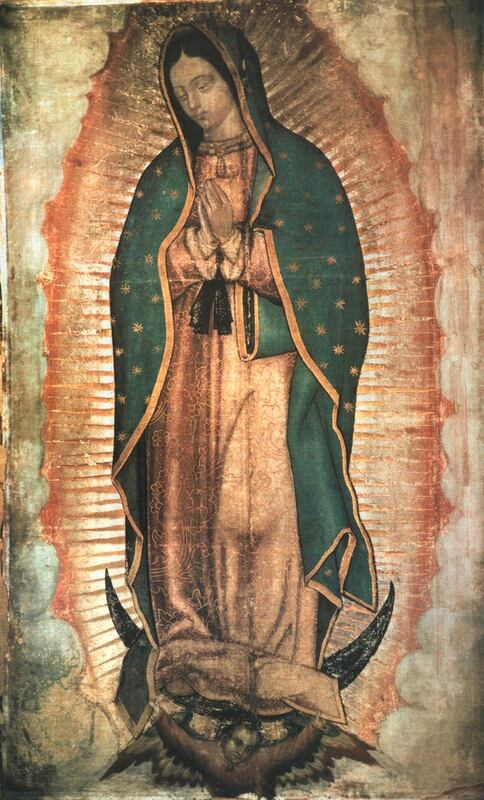 To him the Virgin Mary revealed her compassionate and motherly presence and care for the peoples of the Americas. As proof of her coming she left a miraculous image upon Juan Diego's apron (called a tilma), the same image as is on my prayer cards today. Juan Diego was a local family man, of the culture and people of the region, and yet chosen as part of Our Lady's evangelising strategy. She herself was an insignificant girl from an unremarkable town at the time she was called to be the mother of Jesus. Evangelisation is a big complicated word, but it basically means 'tell someone something good'. The something good we have to share is the value we find in our relationship with Jesus, and our experience of His mercy, forgiveness and trust to those who are seeking faith, hope and love in their lives. True evangelisation is domestic not institutionalised. Families always personalise our humanity. Whatever I have done or not done, I am always someone in my family, even though the world will frequently treat me as a something. Join with me in sharing with our neighbours the reason for the hope that we have in Christ. The deepest truths are found in actual situations. Our incarnate God likes to do things personally. A parish is a family of families. Often we refer to parish by the uninspiring name of 'congregation'. A far better description of parish would be a neighbourhood of grace. In these neighbourhoods of grace, streams of grace are constantly flowing through the sacraments, mutual service, and prayer. Parish life can be messy and frustrating at times, but parishes are still our homes. A parish is a place that trains its members to be evangelisers. To do this a parish has to also be in constant contact with the live, homes and families of its people. Growth in the discipleship of the laity has been a feature of recent decades of the Church's history. To become mission orientated doesn't require great plans, but it does require local starts. When Jesus sent His disciples out to proclaim the Good News, He sent them out well before anyone started thinking about who gets to do which job. Our pilgrim Church is mission orientated by its very nature. It is all about the mission. I wish to encourage and acknowledge the channels of God's grace that are our priests, deacons and consecrated religious. I wish to also affirm that a parish family needs both priests and people working together in order to flourish. I also declare that our vocational doors are open for business. Encourage the young people in your lives who seem to be taking God seriously to come and talk to me. Be co-responsible with me for vocations. It comes down to Be or Breed. I'm doing my part Be-ing called by God to serve in an ordained vocation. Those of you who can Breed, go for it. When it comes time for you to make vocational choices, make them with God, trusting in Him. I promise you that I will never preach this long again. I greet all of you in here, in parishes, schools, at home and online. Please pray for me as I undertake the role of bishop among you. I entrust my ministry and diocese to the intercessory protection of Our Lady, Star of the Sea.